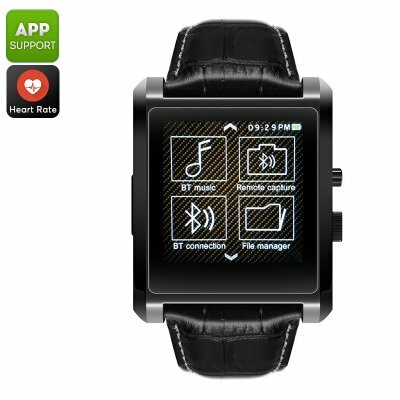 Successfully Added Domino DM08 Bluetooth Watch - Heart Rate Monitor, Pedometer, Sedentary Reminder, Sleep Monitor, APP, Bluetooth 4.0 (Black) to your Shopping Cart. Simply pair the Domino DM08 Bluetooth watch with your smartphone and enjoy increase connectivity from your wrist. This smartwatch is compatible with both iOS and Android phones. It comes with its own mobile Application and supports Bluetooth 4.0 for lag-free data transfers. Once paired with your phone, it will inform you about incoming phone calls and messages. Thanks to this, you’ll always be aware of it when somebody tries to reach you. With its premium design and stylish 1.54-Inch touch screen, this Bluetooth watch can be worn with confidence at any occasion. It comes with a powerful 350mAh battery that treats you to days’ worth of usage time. The Domino DM08 Bluetooth watch is great for people who wish to increase their activity levels. This little sports watch features a pedometer and heart rate monitor. The pedometer keeps accurate track of the steps you take each day. This makes it easy for you to analyze and increase your current activity levels. The heart rate monitor furthermore provides you with valuable health information on the current status of your stamina. With all this data at hand, you’ll be able to work effectively to meet your future fitness goals. Your watch furthermore comes with a sedentary reminder to make sure you’ll never slack off and miss out on a workout session again. With its sleep monitor, you can be guaranteed to get enough rest in between exercise sessions. Thanks to this, your body will recover efficiently which allows you to workout in a healthy manner. With the Domino DM08 smart watch at your side, you’ll reach the fitness level of your dreams in no time.